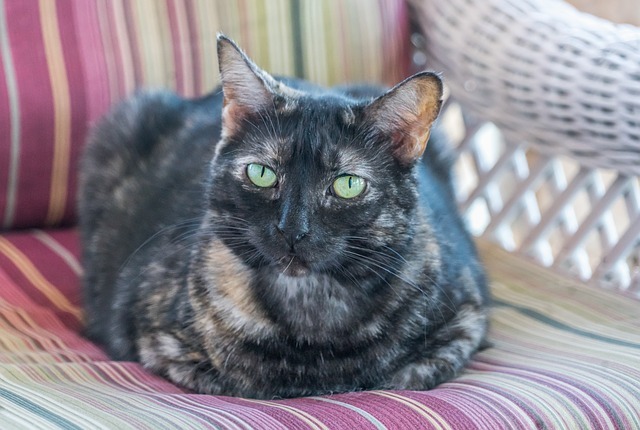 This is a common question, especially among people that have not enjoyed owning a cat before, and there are many variables involved that will determine how long your tortoiseshell cat will live. The average length of a cat’s life is around 15 years, but there are a number of factors in play that determine whether she lives to a ripe old age or not. Some breeds of cat live for longer than others, so because tortoiseshell cats are not a specific breed then this can have an impact. Genetics can also have an influence if your cat inherits any genes that can make her prematurely ill or shorten her life. If you let your cat outside, then she will face dangers and hazards that indoor cats won’t face, such as road traffic, poisonous plants, other wildlife (such as dogs), and mean people that just don’t like cats. Tortoiseshell cats are very inquisitive so they do love to be outside exploring the garden and the neighbourhood – she just would not be a happy cat if we kept her locked up indoors all the time! However, if you live in a very busy, urban environment or next to a main road then you probably should keep her indoors. If you look after your tortie and keep her in good health there is no reason that she should not enjoy a long and happy life. Some cats do live to be beyond 20 years, although this is quite rare – but if you are just bringing a tortoiseshell kitten into your home then you have many years of fun to come with her! How old is your tortoiseshell cat? Let us know if she has lived to a ripe old age and if you have any tips for us! I have a long hair Tortie named Foxy. The question I have is one l haven’t see any information on. When she eats or when she is cleaning herself (which she does a lot), she makes a lot of sounds. At first I thought she was in pain but soon realized she is just like that. The source she makes when eating are almost nom nom nom nom. When she cleans herself, it’s more like sounds that made me think she was hurting. She is 7 and I’ve only had her 3 months. She came from a home where there were 3dogs and she didn’t get much attention or toys or affection. Mostly in and out trying to stay out of the dogs way. Now she has me to herself and run of the whole house. I have adopted a rescue tortoiseshell I’ve named Molly (though I’m thinking of changing it to Fatty as she has put on a lot of weight). She’s about a year old – just a guesstimate as she was caught in a trap on a farm. I didn’t know tortoiseshells are inquisitive but that explains her nature. I doubt she will live long because of this. When I took her in, she had very nasty wounds on her back that the vet thought was from getting caught in barbed wire or possibly a trap. Of course, the day after I decided to officially adopt her (I’d taken care of her for 6 weeks. There had been no interest and I’d grown quite fond of her in that time, as had my other cat Momo – a black abyssinian) she came staggering in dragging her back leg and with two massive puncture wounds in her back. Thankfully both had just missed her spine. Dog attack no doubt. She recovered use of her back leg but it’s not 100%. Molly is a lovely friendly cat but oh so accident prone! I can’t see her lasting another dozen years. My torti is 18 yrs old, lives in and out, still going very strong, sleeps most of the day and eats loads! Had some teeth out recently as they were causing some discomfort but other than that you would say she looks like a youngster. Our torque is a rescue and since moving in with us, she doesn’t leave my side. She is 15 years. Has in last couple years had a couple health problems, but are all corrected and shes going strong. Our torti Cassie is 18 and very thin but eats a variety of soft food which she can choose from many times a day.She also likes treats and some hard food. At this age she may have whatever she wants! She lives with four other cats and two dogs. She prefers the dogs. So glad to have this rescue cat. A character for sure.. feisty with all the cats and knocks items off the kitchen counterwhen she wants to eat. She was 11. Just passed today. Doing a google search to see if her breed specifically was her downfall. I’m heartbroken to have lost my baby. I’m sorry to hear about the loss of your beloved girl, and that in time your heart will begin to heal. My daughter saw a Tortie kitten up for adoption with her littermates at PetSmart during a Saturday event. We gathered her up with some supplies and toys and brought her home. She turned a youthful 9 last May and I cherish everyday with her. I just inherited a sweet Tortiseshell female from a tenant in my building. He has a problem with alcohol and didn’t treat her very well. Her name is Dollia and she is 5 yrs old. He got her from our local Refuge League. She was spayed and had all of her shots. He was going to take her back but I offered to take her (I had to put my 17 yr old sweet buddy over the Rainbow Bridge because of lung problems and renal failure). I was without a furry friend for about a year and I was ready to adopt ( I prayed to the Lord to find me a furry friend and he answered me). She is very skittish but I have plenty of patience. I grew up with cats and I can’t see my life without one. I feel so blessed. My cat is 5 years old and her name is Luciana ‘Luci’ for short. I rescued her from the humane society. They were just about to put her down but I fell in love and had to have her. She is the best cuddle bug and loves to watch t.v. with me. She can never get too much love and often demands it lol. My tortie will be a year this month as of 4/17/2018. Her name is Mystic. I chose this name based on her personality, because …well every day is magical since I brought her home at 8 weeks. She’s not a pet though she became my daughter. You have inspired me. My Sadie is 17 and has been having an episode for the last two days. She seems as thought she is lethargic with a hairball, and I had to force feed her today since she hasn’t eaten in two days. Because she is still going strong. Lots of tears and telling her how much I love her, but you have given me hope. I’ve had my tortie since she was six weeks old. She is now 18 years old and still going strong. She talks a lot and her fur is still soft and well groomed. She is beginning to have some digestion problems now though. It’s good to read about everyone else’s torties and how they are managing this. My tortie Drew likes to drink water from the tap and prefers just to lick the gravey from her cat food. My Tortie is 5 months old, I am picking her up tomorrow. I’ve been doing a lot of research on the Tortie and cats in general. .as I’ve only owned dogs my whole life. .I became infatuated with Torties because I love their color and how it makes their eyes stand out. They are remarkably beautiful cats, we’re calling our Tortie Reeses. My tordie Goldie is a wild thing sometimes and the sweetest cat ever at other times I got her when I was at my parents house and I heard a meowing and found a cat! the next day I was going to leave to go to Canada. my parents did a little research and found out that she use to belong to the people that lived up the street but they abandoned her out side, so she ran away and now belongs to me! Our Tourtishell cat “Mittens” loved us so much. She was very sweet and gentle. She was small but she was full of energy and fun. She was also very pretty with small specks of white, tan and black. She greeted us with a happy “meow” when we got home from work, then she jumped up on the bed for us to pet her and rub her ears and to play with her. She also ran to a certain spot on the rug when we came upstairs and kneaded it to let us know she was glad to see us. She would look for us and rub her head and face up against my ankle to let me know she was ours. We adopted her in 2004 and we were told she was 3 years old then. She became sick recently, stopped eating or drinking and would not respond to any fluids or other treatments from the vet. Her “meows” changed and sounded sick. This happened very suddenly. I guess she was 16 years old by then. We had to say goodbye to her yesterday at the vet. She was my first cat and we would talk to her and believe it or not she talked back to us. Once I got sick and had to have surgery. She would come and sit quietly with me on the couch as a recovered. I am already missing her very much. My Tortoiseshell cat is also named Goldie. How funny. My tordie Goldie is a wild thing sometimes and the sweetest cat ever at other times I got her when I was at my parents house and I heard a meowing and found a cat! the next day I was going to leave to go to Canada> my parents did a little research and found out that she use to belong to the people that lived up the street but they abandoned her out side, so she ran away and now belongs to me! I have been blessed 21 years & counting with my tort, Natasha!!! I am amazed as well as her vet of how her hearing, vision and agility are excellent. I do have to give her fluids every other day for her kidneys and special food as of the last 2 years. As long as she gets those she is great. She loves to lounge in the sun, goes on adventures sneaking into the garage while I am doing laundry or sneaking outside when I water flowers. She has her energy bursts through the house, acts silly, loves car rides and is very, very bossy. She is my little shadow and has been with me through many life events. I am so grateful of each day we have together. My Torti, my beautiful baby girl Timone, passed away in her sleep April 14th, last week. She was 3 months shy of 22. I had her from the time she was a kitten. I’m still so heartbroken over losing her. She experienced life’s milestones along side of us. I became pregnant a few months after she came to live with us. She spent my entire pregnancy laying on my tummy. When my daughter was born, she was like a “second mommy”. She and my daughter had a special bond. My Timone was so patient and loving towards her but she was always my little fur baby. She loved cuddles and was so affectionate. She didn’t take to other animals, but later in the years when she was around 14, I had rescued a 3 month old Chug who we named Zeus. She absolutely could not stand the puppy. But he had a way of getting to her. He adored her. Eventually she “tolerated” him and they would cuddle and even groom each other. I have a huge soft spot for our four legged friends and our family grew. I would say “I have two cats, two dogs, a skinny pig and a kid ;)” My morning routine consisted of “Woof woof, meow meow, and squeak squeak” breakfast time. She was so motherly to all. I am missing her loud raspy meow so much 🙁 Late last year she started slowing down and sleeping a lot more. Then the weight loss started. Although she was still eating well, she was losing her muscle mass. I read on here that when your beloved crashes, they crash hard and I too found that to be the case. My poor girl, still so affectionate and loving, would need help to her favourite spot on the couch etc. She would sleep there close to everything, litter, food, her favourite heater floor vent. I woke in the morning to find her sleeping on the floor vent, only this time she wasn’t sleeping. Losing her has been devastating. No matter if you try to prepare yourself, the pain is deep. My heart is broken. She will always be my beautiful baby girl. I had two cats . There names were ready and steady . One past away nov 2016 and the other one Dec 2017. They were both 4 years old . They were very special to me . Steady love to cuddle with me in my bed. Ready love cuddling in my bro bed . When steady died It was after thanksgiving . I had just went back to college and got the call . Ready how ever I was home. I still miss them to this day . I’m so very sorry for your loss. It sounds like you gave Timone a truly wonderful life! My tortie will be 13 this year. She is a sweet spoiled baby. But I wouldn’t have her any other way. Our Tortie “Fluffy” (My now 26 year old daughter was four when she named her for her softness) was a stray and she adopted us 1995. She wasn’t a kitten. I’m happy to say she is still around and has moved many times with us. Her back is not as strong but she runs when leaving her litter box like she was being chased by the poop monster. Her fun at times becomes matted from lack of grooming and she started this loud meowing several years ago after our 15 year old beagle died. My tortie Pepper is nearly 17. She was diagnosed with hyperthyroidism approx 4 years ago and I’ve been feeding her prescription diet food for thyroid ever since. I took her vets yesterday which was well over due and was shocked that the vet was so negative. She’s very thin 2.4 kg but otherwise still does her daily routine. Vet as taken bloods and we are awaiting results but he basically says I should think about her quality of life and I know he’s getting at putting her to sleep he thinks she may have problem with kidney/liver. I don’t know what to do how can I put her to sleep when she seems OK. Mine is also 17- and is also hyperthyroid. She is also losing muscle, and she’s lost weight, but she’s still active and loves eating and everything else seems totally normal! I hope your girl is still with you, and screw the vets that are pessimistic! Our cat Phoebe is also 17 and has hypothyroidism. She has been prescribed Vidalta 15mg and has been on them 3/4 years now. But do not let the vet give them to you. They charge far to much. Get a prescription off the vet and buy them from pets drug online a lot lot cheaper. Yes you have to pay for the prescription about £13 but you will still find it a lot cheaper. Also vets only give 90 tabs but pets on line give you 100. My cat, Natasha is fifteen and a half years old. She recently began to encounter some health issues, specifically, an over-active thyroid gland and also, either irritable bowel syndrome or intestinal cancer. She takes two medicines: methimazole 5 mg for her thyroid gland, one pill in the morning and half a pill at night. She also takes prednisolone, 2.5 mg every other day for her intestines. I’ve noticed (anecdotally) that tortoise shells seem to be prone to thyroid dysfunction. If you cat experiences dramatic weight loss over a short period of time, rush her to the vet! My tortie, Jade, is 13 years old. She is so beautiful and sweet, at least with me! I’ve had her since she was 8 months old and she has been my baby since the day I brought her home. She doesn’t care for anyone else. She actually hisses and growls at other people. But she sure loves me! She’s an indoor cat only and is in very good health, other than being a bit overweight. I’m hoping I still have a few more years left with her. Whenever I think about how old she’s getting and that I may not have that much longer with her, I start crying. I love her so much and can’t imagine my life without her. She’s so precious to me! Torties are notorious for being one-person cats. My Natasha, being what is often called a torbie, or tortoiseshell tabby, or patched tabby has a less persnickety personality. She is very mellow, but at the same time, very slap-happy. She will accept pets from anybody, for the most part. She’s a good judge of character and there are some people who come and go in my house who she will avoid at all costs. The only time she ever hisses is when on of our other cats start playing rough with her. She is 15 and a half years old. i post a lot of videos of her on Youtube. Here’s a link to my channel if you would like to meet her: https://www.youtube.com/channel/UCyWyRCKgu2perKlsp8CXiTA God bless you and your precious kitty. Don’t waste time crying over her eventual loss. Instead, enjoy every minute you have with her! I have a tortie named Pinky. She is 12 years old. In June of 2013 she was diagnosed with Pacreatic cancer. I was so devastated. One night I searched on line for any stories about cats with pancreatic cancer. This one lady said she fed her cat pink salmon in water just like albacore tuna every other day, including the water Pinky loves Salmon water especially. Anyway, the lady said she got 2 more years out of her. Maybe it cleans her system. Pinky is still going strong today and I continue giving her the salmon water first then she eats the salmon pieces. This is done every other day and it does boost her energy too. I am so glad I have gotten 3 more years. My hubby and kids still cannot believe this miracle. What an amazing story! Thank you for sharing this. Although my Natasha does not have pancreatic cancer, it appears that salmon has medicinal qualities that should not be overlooked. Natasha, who is 15 and a half years old, will start getting regular meals of salmon per your advice! My old siamese cat Bailey died of pancreatic cancer. I wish I would have known this. My tortoiseshell Chloe is 13 and very healthy, so she should have a while longer. She is very skinny, and always has been, hence her knickname shrimpy. I lover her to death and she’s been around since I was about 5 years old, so she’s been there as long as I can remember. My torti, Miss Kitty, is almost 19 and has been an indoor pet…she doesn’t look her age and still enjoys a few kitty cat activities…loads of tortitude! She’s had digestive problems so I will take the advice of trying some plain yogurt for her gentle tummy… She also took a liking to natural coconut oil…it must soothe her somehow she discovered it when I was lathering it on after sunning, and licked it and insisted on having a little every day since! My Natasha like to drink cold black tea with a spot of skim milk. I think the anti-oxidants in the tea are helping to keep her health up. She’s 15 and a half and despite a few medical problems is still an active, vivacious girl. I do give her yogurt, but not on a regular basis. I may start giving her a wee bit every day. Thanks for sharing! I got a cat she’s is on her way to 20 and still plays like a kit, she also has no grays and is not going blind, I must have one of the rare kits here! Bless her heart! But I feel obliged to warn you that cats can crash very suddenly and very quickly. My Maxwell, and black and white tuxedo cat lived to be seventeen years old. On his 17th birthday, he jumped up on the counter, as spry as a kitten for his breakfast. A month later he crashed, could not keep any food down. I don’t need to go on. You know the rest. Just remember to treasure every day your have with your kitty as a gift and don’t take them for granted! We lost our beautiful tortie girl Tids, short for Tiddles, few ways ago we are heart broken. She was the most adorable cat 16 year old cat. The vet diagnosed lung cancer, we don’t smoke so not sure why or how but she was off her food and had a bit of a cough. She went down hill very quickly even after a steroid jab to help her which it did for about a fortnight. She always hated the vets so very much she was very difficult to be handled by anyone but us. For the consultation she had to be sedated to be checked over. Fortunately for us at the end she didn’t out up much of a fight she was really to go. She was a stable cat whose mother had stopped feeding her so we rescued her when she was 5 weeks old (she was so tiny which is why Tiddles was the most suitable name) we took her to the vet who said if she could eat and drink by herself she’d be fine. To our amazement she learnt very quickly and we slowly gained gorgeous cat with attitude and although a bit skittish with others with us she was a bossy little cat who dictated us all. Time to get up, time to eat and time to go to bed. That also included the dog Alfie a cairn terrier who she adored she would rub herself against him if he let her. We miss her dreadfully even Alfie keeps looking at her step to see if she’s back, sadly he doesn’t understand. My tortie, Josie, is 20 years old and still going strong! I’ve kept her as an indoor cat but she spent the first year of her life as an alley cat before I got her at the pound. She’s lived in 3 different states so far and never stops talking. She’s wonderful!! Yesterday I lost my sweet baby Tigertail. She was fourteen years old, and I’ve had her since I was ten. She was a barn kitty my parents took home to surprise my brother and I. She was fairly skittish her first couple of years, but eventually picked me as her person. She loved me the most it seemed, would talk to me with her tortie raspy meow, and follow me around everywhere. She used to wait up for me in the front hall to get home at night. She was a curvy cat, with a perfect thick orange stripe down the centre of her predominantly black face, that went right onto her nose. She has seen me through the many changing stages of my life, the many things that happen between 10 and 24. When I moved out of my parents house, she came with me. She watched me grow up, and loved me unconditionally. I am completely heart broken. She was unlike any other cat I’ve ever met. My parents have many other wonderful fur babies, but I was her person. I knew I would be torn up the day she’d pass, but I had no idea it would ache this terribly. She was completely healthy as youthful, until she just wasn’t. She stopped eating and drinking a few days ago, and when I took her to the vet I was told she likely is suffering from kidney failure, or a large stroke, both of which aren’t curable and don’t provide a very good quality of life even in the best case scenario. My torties name is reeses.she s been with me since she was a cpl weeks old.she was abused so young and i didnt think she was gonna make it sometimes at first.she bled when she did bowel movements for awhile i just loved and spoiled her.oone day she used the potty ansd no blood:)yayyy.i got her fixed asap i dont think she could bare kittens with so much trauma.shes almost 13 now.grouchy as heck.no teeth but very beautiful and precious still.i love her shes a survivor. I have 2 torie’s 1 is 13 and also has digestion problems. I wonder too if there now may be scar tissue due to constantly throwing up, that makes it worse and harder for her to keep things down. She has had the throwing up problem for 7 or 8 years. My oldest Tortie is now 16 and had problems when little but since she was maybe 3 or 4 when she stopped throwing up. Rarely does now. She too is very energetic – loves to play. She has gotten a little more ‘cuddly’ as she has gotten older. I worry that is because she is not feeling well. She has never liked to be held. Still doesn’t but likes to sit next to me a lot and never had before. She is very shy. The younger one is the alpha kitty. Mine is 19 years old. She seldom grooms her fur or paws. She is a rescue cat who experienced great trauma before I adopted her. We have 3 other cats who terrorize her in cycles and in tandem. She fights all attempts to trim her claws, and she has such adverse reactions to “yearly shots” that our family vet has discontinued vaccinating her (more than the 3 year’s now). I don’t want to “put her down,” but she is suffering. Any advice? My Tortie ‘Tordie’ will be 13 this year and the vet always think she’s half her age when they first see her. I have to convince them that I got her as a kitten when I was 17 so I know exactly how old she is. She’s very playful still, goes in and out of the cat door, she doesn’t explore much she stays around my property she is very independent though and hates all other animals even small kittens haha it’s just me and her and she seems really happy that way as she has lived with other people and other animals and this is the happiest she’s ever been. I love her like a child and I hope I get many more years with her. My tortie is 20.5 yrs. old. She has been fed Fancy Feast her whole life. She’s really skinny now and one of her front legs is crooked, but she loves being held, but still going pretty strong. My baby is 21. She still plays and can get in and out of her litter box just fine. She is just the best cat 🙂 she is so sweet and loving. My Tortie Cally is 20 yrs old and for a year now when she uses her litter box she will only do her #1 in the box but will not do a #2 in the box at all I’ve looked it up on the web sight but it just runs you around to all kinds of different sights but never get your question answered. Does any one know why? Hi Carrie. Pooing in the wrong place can be associated with “separation anxiety “ in cats. Also it can be their way of telling you all is not well. Was there a death in your family just before it all started? Did someone leave your house hold a year ago? Think back and you may find the reason. Hope this helps. Get her checked out anyway. If there is grief involved, homeopathy “ignatia” is the remedy for grief and can be given to animals. Good luck. Have a tortie who’s 16 and has the best blood levels of any other cat her age. Vet says its like shes actually half her actual age. Just met another tortie last night who’s 21!!!! My tortie just died on Aug.4 2015. She was so cute and very social. She always met me at the door when I got home. She was 16 yrs. Any advice on helping my cat to live a long, healthy life? Our tortie, Mia, is now 19 and has amazed us; she was diagnosed with a heart condition at age 4 and had to have tablets every day. She collapsed several times and every time fought the vets who tried to treat her. I eventually stopped giving her tablets after she spent so much time outside and missed so many of them. She has been absolutely fine for the last 8 years! I recently took her to the vets because she had an ear infection and she proved that she was still as feisty as ever! She has become tolerant of the children who have arrived to invade her space but they know who is boss. Long may she live! I had to let my little girl Pretty go on the 11th of May 2015. She was a Calico Tortie. Pretty was a stray around the gardens for about 2 yrs before she adopted me. I was NOT a cat person, but early evening of the 22nd of May 2008 she just jumped off our shed and walked up to me. I could’nt believe it! A quick trip to the co-op a tin of Whiskers and the rest is history. What a wonderful time we had. And a steep learning curve for us both!! Her health declined since August 2014. I nursed her, and she fought a good fight, but on the 11th of May I could see by the way she looked at me my little girl had had enough. That late afternoon I took her to our vet whose had been wonderful throughout her illness and I just cuddled her as she slipped away. I am devastated. I’m nearly 70 and have shed a few tears in my life, but the pain of loosing my Pretty girl have cut me deeper than could ever have imagined. Thank you for giving me the opportunity to share my loss. I will get another like Pretty they are so special. I’m sorry and i understand the loss. I find it harder losing a cat than a human. Try homeopathy “ignatia “ for grief. It does help. Feed the best cat food, natural balance has worked well for val, and do not feed any fish, fish cat food. the fish cat food is made from fish heads, the thymus gland gives the cat hyperthyroidism. we have a new youngster in the house, expecting years of fun. our cats and both sisters and are nearly 18 years old now, we found them in a skip in 1997 and still running around and no health problems. they only look about 10 years old too! We are in a very similar situation with our cat Luna. She’s a 3 year old tortie. We adopted her from the shelter a few years ago. She throws up on a weekly basis. She has tons of energy and doesn’t show signs of being ill. I know she eats too fast and she gets too excited when a new scoop of food it put in her dish. I wouldn’t be too worried. We’ve also had the routine tests done and nothing has come up. I try putting a ball in her food dish so she has to eat around it and can’t eat everything in 20 seconds and if I give her soft food I mix it with hard food so she doesn’t inhale it. Please let me know if you figure out how to make yours stop vomiting up as I would like to know too! Could the vomiting be caused by anxiety out nervousness? I had a cat that vomited quite often. After numerous vet visits, having tests run, and then trying different types of kibble, it was assumed that anxiety was causing the vomiting. And that cat lived until 18. Hi, we have a Luna, rescue tortie as well! Our tortie is a 1 year old, also a rescue and she has vomiting a few times a week, about every 6 days. She is playing and happy, also had tests (blood and xray) that came back fine. We are trying gastrointestinal food, no change after 3 weeks but read that it can take a few months. Thank you, I hope everything is fine with you and Luna! I had the same issue with my tortie. I had her on Blue Buffalo and switched her to Nature’s Variety Instinct because it is grain free. Once I eliminated grain from her diet she hasn’t had a problem. Also, when I introduced the new food, she ran right to it and gobbled it down. I have a 5 1/2 year old tortie and she was constantly vomiting just like yours. I have had her on the same food all her life but all of a sudden she just started doing it. One day I accidentally bought kitten food instead of adult food. Completely solved the issue. I talked to the vet and he said it was fine tonfeed her the kitten food since she is very active just limit the amount of treats I give her. My cousin who works at the local Humane Society also says that’s what they give their cats who often vomit because it seems to be easier on their stomachs. Did you ever sort our the problem with vomiting? We have a tortie, 1 year old, also a rescue and she has vomiting a few times a week, about every 6 days. We aren’t sure when she was taken from her mother. She is playing and happy, also had tests that came back fine. We are trying gastrointestinal food, no change after 3 weeks but read that it can take a few months. Thank you, I hope everything is fine with you and Nala are fine. Try the blue buffalo sensitive stomach, it’s in a pink bag..seems to work for my kitty, she’s 9 yrs old now..she had some stomach problems when young, seems to gone away almost completely. . I had two adorable tortoiseshell cats called Fatty & Lighty who both lived to the ripe old age of 22. These weren’t the original names given to them when I first got them as kittens but after a few years Fatty got fat & Lighty was lighter in colour & in weight. How cruel was I but I loved them to bits, they were my babies & still four years later it break my heart that there no longer with me. Our cat Cleo is 19 1/2yrs. She started having fits at the end of 2013 and we thought we would have to have her put to sleep. However we have an excellent vet and she now has Epiphen drops. She is an outdoor cat and has been on dried food most of her life. We now have to add the drops to her food so best to disguise in sardines, just a mouthful. The vet says she is otherwise a healthy cat, considering her age, and expects to see her for her annual booster in 6mths time, when she will be over 20yrs! She has also spent a lot of time in and out of the Cattery over the summer months which doesn’t seem to have affected her. We have a small tabby cat who keeps her company and she is 19yrs and in very good help despite her size. My cat Calvin is 18 years and apart from being less energetic she is still in good health. She is a house cat, so that may explain why she has remained healthy. She has been on dried food (Science diet) throughout her life, but I will bear in mind the comments made in other posts if she starts to have difficulty eating. I have been lucky to have a very mild mannered cat who seems content at all times. It was nice to read that some other tortoiseshell cats have lived to their mid twenties. Hopefully my Calvin will too, as she is a big part of our family. My tortoise shell (Cheech) is 6 years old now. She loves to escape outside and hunts all the time. Her brother from the same litter is an orange short hair, and they were both really sick as kittens. Her mom looked just like her and her dad looked just like her brother. I found out that she has feline leukemia, probably something she never got over as a kitten, despite numerous trips to the vet. At two years old she ran away and I kept searching and searching for her. On the third day, I heard faint meows and went searching for her and found her hiding under the car with a broken back leg. I took her to an amazing surgeon to have a steel plate put on her leg so she didn’t have to have it amputated. She has had chronic problems with her teeth and respiratory infections. I decided to go the holistic route because all the times I have taken her to the vet, she has never gotten better. One even caused blunt trauma to her eye that took an entire year to heal, if it is even completely better. If you cannot tell, I love her more than anything. She is the sweetest cat and everyone that meets her loves her. She is pretty vocal but it could be from her ailments. She doesn’t fear anything unless it is a VERY load noise. Oh, and she fears the evil people in white coats (veterinarians). When our roommate’s cat or dog tries to play or attack her, she simply ignores them but is more cooperative with the dog. She snuggles my husband and I every night, and sleeps between our legs. Torties can live to a ripe old age. Pepper – our one has only recently ‘gone upstairs’ but she was 22 years old. The biggest problem we had later on was with her teeth and she struggled to eat dry cat foods so was on wet food and at the latter stages was on a special nutrient diet for associated problems. Don’t feel guilty about putting your cat to sleep when the time is right. If you feel guilty and sad about it it means that you have provided a quality life and bond with your cat which is something that is reciprocated. My wife and I think of all the great times we had and know we did not want our cat to be in pain at the end. If torties don’t like their environment they soon let you know or wander off somewhere else so safely say if they have hung around there was a good reason to. For such a small cat she was incredibly territorial and regularly saw off other cats even at the end. They are incredible characters and will really change your life and home. Our tortie is not even a year old but I looked up how long will she live, because we have never fallen for a cat like this one. She does insist on going out but she’s fenced in from other dogs than our own, and I believe she went exploring awhile back and got lost. Now she stays around the greenhouse and back door and goes and comes thru the doggie door like the mutts. She prefers to be around us and if we go in from chores, she’ll follow like she’s a dog. She is a brilliant cat, will chase and bring back rolled up pieces of note pad, she demands much loving and rubbing and scratching. If you seem to be slowing down, she closes her eyes and baby meows so cute. I tell everyone, look for a tortie to adopt. Ours found us at about 12 wks, someone probably put her out. We have just adopted a lovely tortie but she is sick every few days. Vet can’t find anything wrong. Is this a tortie thing? Hi Carol, we have a one year old Tortie, adopted and also wondered the same thing. She vomits about every 6 days and a couple of times. She had her blood tested and xray and fine. She plays and is happy. Did you ever find anything? Hi there. Take her to another vet and get a 2nd opinion. Vet differ in opinions and diagnosis. Maybe treat the immune system and change diet. My cat Ruby is now in her 21st year. She has digestion problems which means that she eats a lot of food but doesn’t digest it efficiently. Despite that, she is in good health, & has a good weight. Paul, I would offer a recommendation of probiotic for your tortie with digestion problems. You can get a powder in individual packets to add to the feeding from your vet or feed a teaspoon (or more) of plain yogurt 1 – 2 times a day. Most cats and dogs enjoy plain yogurt! I have a 15 year old tortie named Sara. Hope this helps. This is excellent advice. I am going to try this with my tortie who is named Bird because of her hoarse meow. She is 5 years old and vomits almost every day. She has tortitude and loves her 6 brothers and sisters.